REVIEW: DHARAM SANKAT MEIN DOESN'T SAY ANYTHING NEW! Between its sentimental leanings and farcical outbursts, the superficial sermonising of Dharam Sankat Mein remains just that -- superficial, says Sukanya Verma. A middle-aged Hindu, vocal in his excessive resentment of Muslims, accidentally discovers his biological parents belong to the very community he jeers at. Cinematographer turned director Fuwad Khan’s Dharam Sankat Mein takes on this intriguing premise in a remake of 2010 British Comedy, The Infidel, about a Pakistani Muslim discovering he’s Jew by birth. While stinging repartee elevated its source considerably, Dharam Sankat Mein is plagued by old tricks, dull pace and tawdriness that’s even more glaring in the view of its first two flaws. Conditioning plays a huge role in a person’s faith (or lack of it) regarding godly matters. Around an intolerant setup, chances are he’ll grow up with a judgment clouded by suspicion and prejudice towards those subscribing to a different point of view. Too often, this myopic mind-set serves as a source of constant Hindu-Muslim disharmony unwilling to embrace the shared message of humanity propagated by their choice of gods if not god men. Dharam Sankat Mein doesn’t dwell on the process but acknowledges its prevalence somewhat broadly. Its plot, plodded by countless mediocre songs, is more interested in the conflicts it leads to. Set in not-quite-dry Ahmedabad, the film opens with a peeved Paresh Rawal (playing a character named Dharam, the title is a clever pun on the same) shutting his ears against a pillow and objecting to the morning azan. What’s odd about this projected hostility is that unlike his family, he’s not really spiritually inclined. His faith is confused, mocking and representative of most folk exhausted by the extremes and ethics of religious identification. And then Dharam learns the truth about his Muslim origin -- one mere realisation suddenly bridges the differences between the aforementioned warring gentlemen. Whether Dharam Sankat Mein is remarking on the hypocrisy of human nature or fostering it, is hard to tell. And that’s where the film goes wrong most of the time. Even though it boasts of actors (if you overlook the indifferent supporting cast) who’d be willing to appear politically incorrect, go the distance; say the words, the script shies away from stating something new or profound post-PK, OMG:Oh My God. 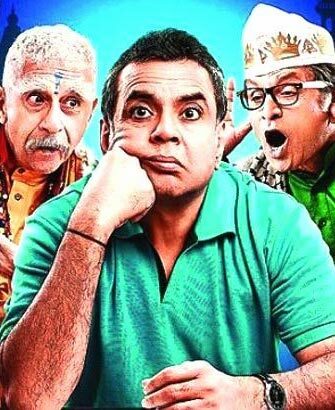 It’s leading man Paresh Rawal, the poster boy for ‘theological coming-of-age’ is remarkably persuasive but he’s already made his case effectively in OMG (there’s even a shot of its DVD to underscore it) citing Bhagwad Gita and Koran as his alibi. More rewarding and hilarious are the parts where he’s engaged in My Fair Lady reminiscent sessions training to be a devout Hindu and Muslim for the sake of his son and the son he wants to be. Annu Kapoor endears as his Urdu-perfect Higgins but Dharam Sankat Mein paints him meek in face of Rawal’s anti-Muslim barbs. There’s anger in him about being the ‘minority’ but no bite in his expressed ire. Even Naseeruddin Shah’s phoney Guru Neelanand, modelled on Baba Ramdev (replete with a reproduction of the escape-in-salwar kameez embarrassment and mock version of his Patanjali range of products), that would work wicked wonders if this were a trippy satire comes across as an inflated, affected caricature here. Ultimately, between its sentimental leanings and farcical outbursts, the superficial sermonising of Dharam Sankat Mein remains just that -- superficial.